This report begins by outlining the history of development and disinvestment of DC’s Wards 7 and 8, recent housing market trends in the DC area, and resident perspectives on new development. It also outlines the progress of the 11th Street Bridge Park Equitable Development Plan, summarizing the goals that have been successfully accomplished and finding that the “Bridge Park leaders and their allies are well on their way to achieving their goal that the Bridge Park be a ‘driver of inclusive development’ for the surrounding neighborhoods.” The authors also describe the complicated dynamics of neighborhoods and achieving equitable outcomes. The report ends with “Insights for the Field” for others looking to pursue equitable development in gentrifying neighborhoods. Citation: Bogle, Mary, Somala Diby, and Mychal Cohen. 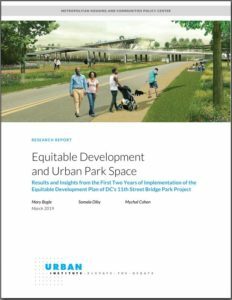 Equitable Development and Urban Park Space: Results and Insights from the First Two Years of Implementation of the Equitable Development Plan of DC’s 11th Street Bridge Park Project. Urban Institute, 2019. Accessed March 15, 2019. https://www.urban.org/research/publication/equitable-development-and-urban-park-space-results-and-insights-first-two-years-implementation-equitable-development-plan-dcs-11th-street-bridge-park-project.